180 3rd graders at the Hilton Head Island School for the Creative Arts staged an original musical titled “The Charleston.” The musical was conceived and written by dance teacher, Patti Maurer, who was inspired to write the musical after hearing CJI’s Dr. Karen Chandler’s presentation on Charleston’s jazz legacy at the South Carolina Alliance for Arts Education Conference in September. Mrs. Maurer consulted with Dr. Chandler over five months incorporating CJI research on the Jenkins Orphanage Bands and Charleston’s jazz history in her original musical. Dr. Chandler was a special guest at the production and was joined by CJI’s Jack McCray and Tony Bell who documented the musical. 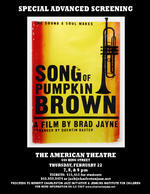 Song of Pumpkin Brown was produced, written, and directed by Charleston-based independent filmmaker Brad Jayne in collaboration with Osprey Production Group. It was shot over seven days on-location in Charleston and on Edisto Island. Funded by a $100,000 grant from the South Carolina Film Office, photography on this independent short film project was completed in December 2006. The film’s unique combination of jazz music, stunning cinematography, uniquely structured script, and powerful performances, has created a momentum within the international film community even prior to its premiere. Song of Pumpkin Brown incorporates source material and photographs from the Charleston Jazz Initiative’s (CJI) archival collection as a base for its script and cinematography. CJI is a jazz history and research project – an academic and community partnership — with the College of Charleston’s Arts Management Program, Avery Research Center, and several Charleston-based community leaders and organizations.